Today my mom and I went to the Hands All Around Quilt Show. It was a great time. There were so many beautiful quilts and so many vendors. We went last year too, but I think there were more vendors this year. And this year was much less gross eventful. Last year the quilt show was on Olivia's due date, so I had her sweet 6-week-old self strapped to my chest in the Moby. Several people kept asking me if she was a real baby. No. I just am some crazy lady and I like to wear a doll on my chest in public. Anyway, we were ALMOST done checking out the beautiful quilts, and sweet baby O's diaper leaked. All over her. All over me. I can't wait to tell my teenage baby someday that she was naked in the Sale Barn (there was no changing table!!). So this year, Olivia stayed home with Daddy. And I really enjoyed myself. I found the most adorable pattern for a fabric book. It's called Ten Little Things for Moda by Jenn Ski. It's a number panel. 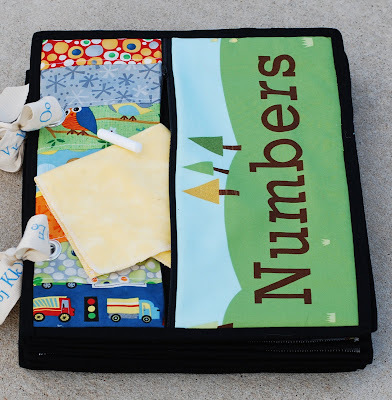 Each page is a number with pictures, and the facing page is made out of the coolest stuff: chalkboard fabric! I can't wait to try it out. There are also pockets built into the book to hold your chalk. So neat! I can't wait to make it for Olivia. 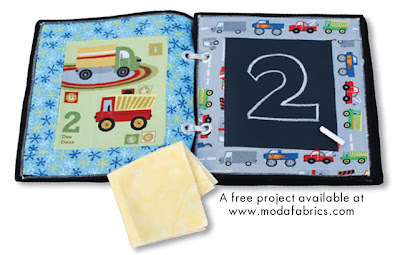 I bought the fabric panel (which came with the pattern) and the chalkboard fabric. I didn't buy the jelly roll. One because they didn't have it. And two, I think it will be just as cute and much, much cheaper with strips of bright fabric that aren't necessarily from the same line. I also bought 1/2 yard cuts of black and white prints. Then I found this Smiley Cow, Pigs, Birds, Bees and a black and white cow print that will go perfectly. I am thinking of making a quilt out of this just in black, white, and red. But then I also think a pop of cobalt blue would be pretty. We'll have to wait and see!